About a year ago, B2Broker announced that it was launching B2BX. This was going to be the first crypto exchange to serve institutional investors. In essence, it would be an exchange that served hedge funds, brokers, professional traders, and other institutions in the world of finance. B2BX boasts of ushering in the new era of cryptocurrency liquidity. In just a short while, the B2BX exchange has grown a lot and continues to achieve new heights. It now offers clients better services than most existing exchanges, which puts it in the CoinMarketCap’s list of top 100 cryptocurrency exchanges. The platform’s position is further strengthened by the recent acquisition of Estonia’s FIU license. B2BX is a leading asset-trading platform that eases access to liquidity for institutional investors. It offers spot trading that allows the trade of digital assets and crypto such as ETH, BTC, LTC, NEO, DASH, and NEM. It also offers crypto margin trading for its clients. It is feature-packed with all popular trading tools such as order execution types and indicators, allowing the users to make full use of each trading opportunity. In addition, B2BX offers a range of benefits which makes it easier for traders to adopt and continue using it as their go-to platform for all cryptocurrency trading needs. Starting with an intuitive, easy to use and navigate platform layout, B2BX caters to traders of all experience levels. All registered users on the platform have access to Traders room where they can make use of a range of tools to analyze the markets and place the right order. Some of the tools provided by B2BX include flexible-interval market charts available for 1, 2, 4, 6, 12-hour intervals along with the daily and weekly charts. Users can also access and analyze TA indicators like Exponential Moving Average (EMA) crossovers, Relative Strength Index (RSI), Bollinger Bands and Ultimate Oscillator to get an in-depth understanding on the market dynamics before placing orders. B2BX is also one of the platforms in the market to offer the lowest fees. It has a maker and taker fee of 0.15% and 0.18% respectively, which can be further reduced to just 0.1% and 0.12% by participating in B2BX Loyalty Program. The Loyalty Program participants will be able to get a 35% discount on all fees and commissions by placing orders with the platform’s native B2BX tokens. Being an institutional investor friendly cryptocurrency trading platform, B2BX has special margin trading options for institutional clients. They can place orders with a contract size of 1, at 1:3 leverage and 33% margin. These orders open at 00:00:00 GMT and closes at 23:59:59 GMT. The flexible trading combined with easy deposit and withdrawal option facilitated by B2BinPay makes sure that the users’ needs are met. 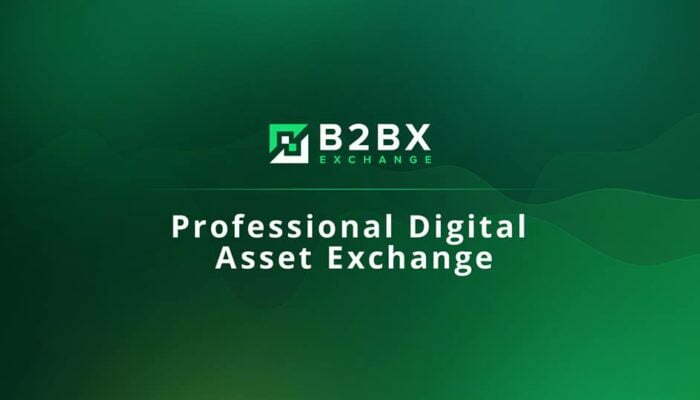 B2BX also implements safety technologies and security features like two-factor authentication to ensure flawless trading and integrity of users’ accounts and funds therein. For a project like B2BX that has gained a lot of prominence in the cryptocurrency industry, it is very important to ensure that the company has a stringent process to list tokens on the platform. The company also encourages new clients to join the increasing number of projects that are being listed on the exchange. On the other hand, the marginal liquidity pool is another level of listing on B2BX which makes the tokens visible to millions of users on various exchanges and brokerage platforms. The listing process for marginal liquidity pool is much more stringent with certain formalities and all the submissions get meticulously vetted, researched prior to acceptance. The white label exchange solution is one of the most sought-after offerings by B2Broker. Developed using cutting-edge technology and tested under rigorous conditions, the B2BX turnkey exchange solution saves the clients a lot of money and manpower while assuring rapid deployment. B2BX always has something new to announce, as the platform continues to evolve at a rapid pace, satisfying the needs of cryptocurrency traders and institutional investors. The receipt of FIU license in Estonia is one of the landmark developments which will open many doors for the exchange. It will be able to extend its service offering to include crypto-to-crypto and crypto-to-fiat services. Besides that, the exchange’s users can now have peace of mind. This is because the exchange will boost its transparency and security in line with the licensing requirements. In addition, the regulation will allow the exchange to increase the daily limits for withdrawals and deposits via bank transfers.